Added support for using SmartCapture without a remote controller and DJI GO 4. Added a group photo mode to SmartCapture. Shortened time taken to power off. Optimized transmission quality when transmitting at 2.4 GHz. Improved takeoff performance to dampen a shaking phenomenon experienced by some aircraft during takeoff. Improved takeoff performance when taking off in conditions that are not suitable for the Downward Vision System. Fixed an issue that occasionally prevented the aircraft from taking off following activation. Fixed an issue that occasionally caused the DJI GO 4 app to display a Downward Vision System calibration error. Fixed an issue that caused the battery level display to be incorrect if an Intelligent Flight Battery was not fully charged when used for the first time. Fixed an issue that occasionally caused the aircraft to land unexpectedly. Added support for using the DJI Goggles Head Tracking Flight feature. Shortened time taken to power on. Changed default control stick deadband settings. Fixed an issue that occasionally caused the remote controller restart automatically. Fixed an issue that occasionally caused linking to fail. Fixed an issue that occasionally caused iOS device to start charging and the DJI GO 4 app not to connect to the aircraft when a mobile device was attached using an RC cable. Changed the default settings for the Function button and Customizable button. Restart the aircraft and remote controller after the upgrade is complete. Please note that the firmware update may reset various Main Controller Settings, such as the RTH Altitude and Maximum Flight Distance, to factory defaults. Before the update, take note of your preferred DJI GO 4 settings, and readjust them after the update to suit your preference. This firmware update resets the camera settings. If the firmware upgrade fails, restart aircraft, remote controller and DJI GO 4 or DJI Assistant 2, and retry. 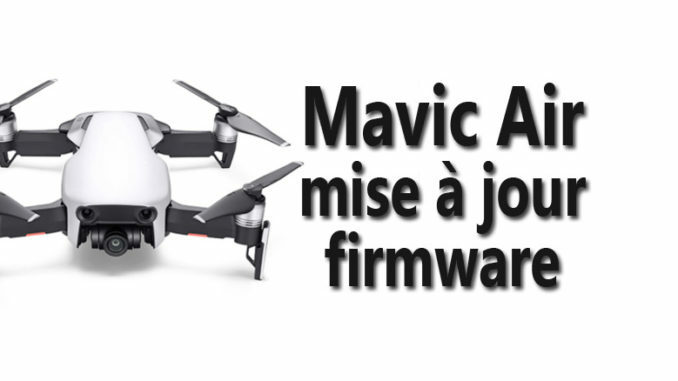 Et voici, le Mavic Air !